A quietly located and well proportioned ground floor garden flat with a private entrance and flexible space totalling 743 sq ft, including eat-in kitchen and two double bedrooms. The garden has an open aspect and is of good size. Cobbold Road runs east off Askew Road all the way down to Emlyn road and is always popular due to its Victorian character and proximity to Wendell Park, local schools and to local shops on Askew Road. It is an approximate 10 minute walk to Stamford Brook or Ravenscourt Park (District Line tubes), and 5 minutes from the 94 bus route east and west on Goldhawk Road, which gives ease of access to Westfield and The Central Line tube and mainline stations. The 266 bus route links Askew Road to Hammersmith Broadway in about a 5 minute journey. 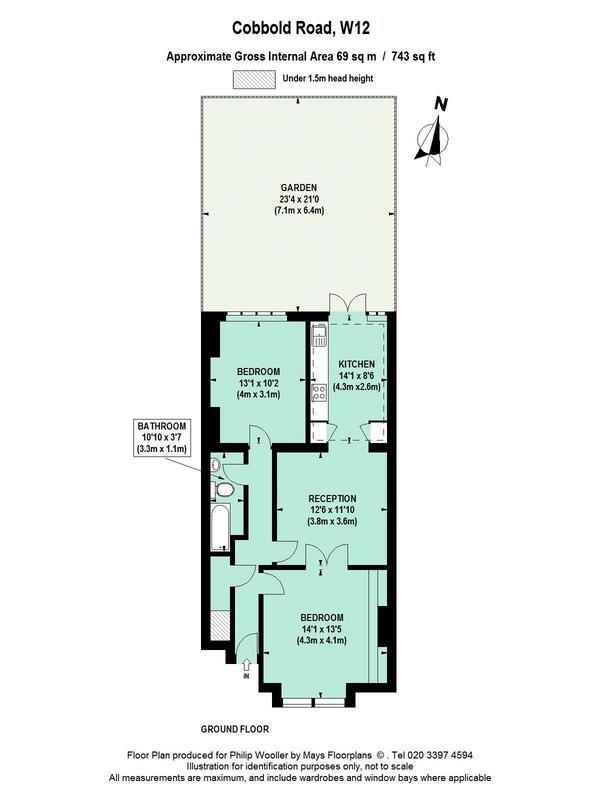 743 sq ft / 69 sq m approx.